This book provides an up-to-date, panoramic picture of the field of intellectual styles through describing, analyzing, and integrating the major theoretical and research works on the topic. Readers will gain a broad understanding of the field--its nature, origins, historical development, theories, research, and applications, as well as the interrelationships among major theoretical constructs proposed by different theorists in the past few decades. In particular, three major controversial issues in the field are addressed by both empirical findings and literature review: styles as better versus worse or as equal in merit; styles as traits versus styles as states; and styles as different constructs versus styles as similar constructs with different style labels. Educators will find ideas on how to improve their teaching and assessment of student performance. Student development specialists will be interested in the book because intellectual styles, as evidenced by recent studies, play a critical role in many aspects of student development including cognitive, affective, psychosocial, and career development. Psychologists will gain an understanding of an important facet of the field at the interface between cognition and personality. Managers in business will find the book relevant to such issues as effective supervision and staff training and development. 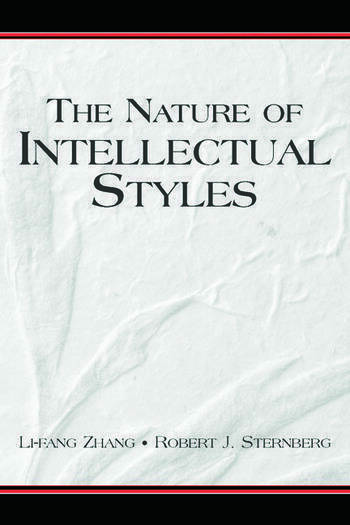 The Nature of Intellectual Styles is intended for anyone--particularly researchers and students in the fields of education, psychology, and business management--who is interested in understanding intellectual styles and their effects on daily life. Contents: Preface. Introduction. Part I: The Field of Intellectual Styles. Surveying the Field of Intellectual Styles. Part II: Empirical Studies: Individual Models. Styles Research: Student Oriented. Styles Research and Applications: Teacher Oriented. Styles Research and Applications in Nonacademic Settings. Part III: Empirical Studies: Integrative Models and the Theory of Mental Self-Government. Existing Integrative Models of Styles. The Theory of Mental Self-Government and Its Research. Part IV: Intellectual Styles: Reconceptualization and Application. A Threefold Model of Intellectual Styles. Conclusions and Future Directions.